Toxic masculinity, which says that showing emotion is a sign of weakness, is not just hurting men - it's killing them. Suicide is the leading cause of death for men aged 20 - 49, and our culture is at the root. The expectations and beliefs about what it means to be a man and how men should behave leads to a stigma behind male health. We want to challenge this idea and demonstrate that showing compassion, love or empathy is not something to be laughed at. We all have ‘Bros’ that we really care about, whether that’s your friend, colleague, brother, dad, uncle, boyfriend or son. It is important to speak about the issues we have and find support in our friends, family, clubs, societies, and services. That's why we're celebrating ‘Brovember’, with the aim of opening up the discussion to highlight the importance of looking out for your mental and physical health, and your bros too! There will be a space within the Activities and Sports Zone each Wednesday in November, 12-2pm with information on relevant services, as well as different events throughout the month to urge students to recognise that their health is of prime importance. 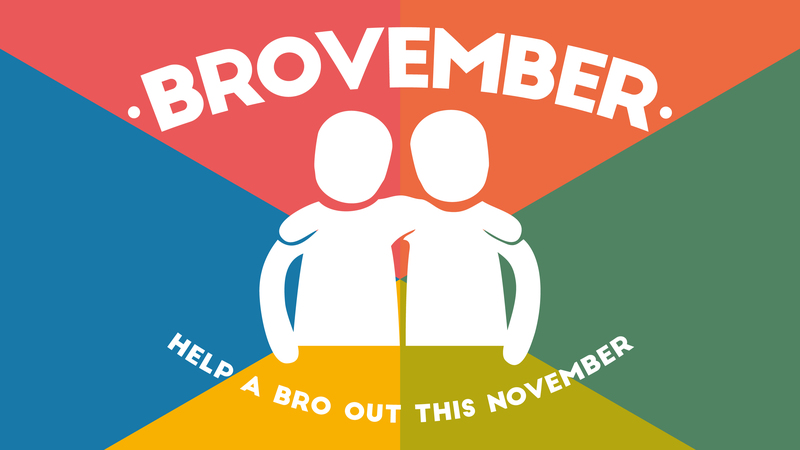 Help a bro out this November. Sheffield Mind is an independent charity, offering a range of services and support to improve people's mental health. Support the Friday drop in session at the Wellbeing Centre which is for people who are lonely or isolated to come along and make friends, have a chat or just enjoy a cup of tea and relax in a safe and supportive environment. You could organise a quiz or group activity, or play some acoustic music, or just come along and have a chat and make people feel welcome. The Wellbeing Wednesday concept was launched by the Students' Union and aims for Sheffield University to allocate specific time in the week (Wednesday afternoons) for our students' well-being. Come down to watch and chat to some of our sports clubs and societies showcasing or performing what they do. Give a sports club or society a go to help look after your mental health and wellbeing. The Wellbeing Cafe uses food supplied from the Real Junk Food Project to cook dishes from food that would have been wasted. The dishes will be served in a buffet style layout, and are normally a variation of pasta/curry/stew/stir fry, with many vegan and gf options. The Cafe is pay-as-you-feel, but in order to keep the cafe running we do ask for a suggested donation of £2. You can just turn up on the day. Social eating, sitting down and sharing food with friends and strangers has been proven to be very beneficial for your wellbeing. A FREE film screening of the Full Monty - a Sheffield based, BAFTA Award Winning, comedy. The Full Monty tells the story of six unemployed men, four of them former steel workers, who decide to form a male striptease act in order to gather enough money to get somewhere else. Despite being a comedy, the film also touches on serious subjects such as unemployment, fathers' rights, depression, impotence, homosexuality, body image, working class culture and suicide. In this session, you will learn how to handle a disclosure of a mental health issue, how to signpost students to the right support services, how to defuse conflict, and more. This session is for members of any sports club or society committee, but is recommended particularly for inclusions officers and captains/presidents. To launch the ‘Let's talk about Eating Disorders’ campaign ran by the Welfare Committee and International Students’ Officer, this panel will be looking at the stigma around men with eating disorders. Magid Magid is Sheffield’s Lord Mayor and so far he’s already had a huge impact, especially when it comes to mental health awareness. Come along to find out more about Magid Magid and how he thinks mental health care in Sheffield can improve, as well as asking him your own questions. The Sheffield Revue have kindly agreed to host a one off stand-up comedy sketch night for brovember this month. So come along with your pals for a humorous night of talent all supporting a selection of mental health charities. Professor Brendan Stone is the Deputy Vice President for Education at Sheffield University. Brendan's research centres on the relationship between narrative, identity, and trauma; mental distress and 'recovery'; and engaged pedagogies. He frequently works with people who live with severe and enduring mental distress (or mental illness), and with statutory and third-sector organisations which provide support. Come and hear him a deliver a guest lecture based on his academic research and experience. This is a special ROAR dedicated to Brovember. We've got loads of moustaches to give away and a photo booth full of props! Come along before hand for open-mic singalongs in the Raynor Lounge beforehand too. This is our final Brovember event! Whether you've taken part in Brovember yourself or just want to show your support, come on down to the Activities and Sports Zone on Friday 30th to celebrate our Bros at this FREE shave off event. Everyone is encouraged to celebrate and socialise in Coffee Revolution afterwards. The Campaign Against Living Miserably (CALM) is dedicated to preventing male suicide, the single biggest killer of men under 45 in the UK. In 2015, 75% of all UK suicides were male. They offer support to men of any age within the UK, aiming to challenge the culture that prevents men seeking help when they need it. Mind provide advice and support to empower anyone experiencing a mental health problem. They campaign to improve services, raise awareness and promote understanding. They won't give up until everyone experiencing a mental health problem gets support and respect..
Chilypep’s purpose is to promote the rights, wellbeing and opportunities of all young people across Sheffield and South Yorkshire. They do this by working with young people to campaign around issues that affect them.